Noosahow do i use a damage number from dif hud to the one im using? maniacalDoes anybody know how to change the font for the loadout panel? I am using m0rehud. ZetosDoes anybody know which file I have to edit to fix this? Thats Spectator.res / SpectatorTournament.res, open them and search for ItemPanel. [quote=maniacal]Does anybody know how to change the font for the loadout panel? I am using m0rehud. 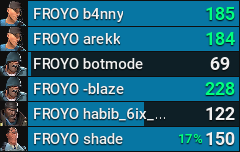 [quote=Zetos]Does anybody know which file I have to edit to fix this? So, I'm using nokk's nühud, and I wanna change how the horizontal health bars work in the tournament spec gui. At a certain point, the health bar will switch to the right side and expand leftwards when health gets low enough. Instead, I wanna make health only go from left to right. How do I do this? how can I remove the border around the chat box, as is usually done in m0rehud and its variants? Does anybody know how to edit boss health bar used in Helloween events and VSH mod? I'd like to make it tiny or disable it completely. tnmDoes anybody know how to edit boss health bar used in Helloween events and VSH mod? I'd like to make it tiny or disable it completely. HudLayout > HudBossHealth if you just want to move it or disable it. HudBossHealth.res if you want to actually edit it. Koncepthow can I remove the border around the chat box, as is usually done in m0rehud and its variants? Little question now, is it possible to make the team switch/balance message box pop up in an offline server so i can easily edit it? [quote=Koncept]how can I remove the border around the chat box, as is usually done in m0rehud and its variants? Hypnotize Zetos Thats Spectator.res / SpectatorTournament.res, open them and search for ItemPanel. bLaSo, I'm using nokk's nühud, and I wanna change how the horizontal health bars work in the tournament spec gui. At a certain point, the health bar will switch to the right side and expand leftwards when health gets low enough. Instead, I wanna make health only go from left to right. How do I do this? [quote=bLa]So, I'm using nokk's nühud, and I wanna change how the horizontal health bars work in the tournament spec gui. At a certain point, the health bar will switch to the right side and expand leftwards when health gets low enough. Instead, I wanna make health only go from left to right. How do I do this? bLa bLaSo, I'm using nokk's nühud, and I wanna change how the horizontal health bars work in the tournament spec gui. At a certain point, the health bar will switch to the right side and expand leftwards when health gets low enough. Instead, I wanna make health only go from left to right. How do I do this? I made the health bars only work for 1920x1080 because I don't know if there's any workaround for making it completely work in all resolutions (working off The Mannterface). I didn't include it originally in nühud, but if you go to spectatortournament.res > HealthIcon, the value of HealthBonusPosAdj needs to be changed depending on your resolution. I added a comment for a couple common resolutions recently, but you'll have to experiment with the value if it's something different. [quote=bLa][quote=bLa]So, I'm using nokk's nühud, and I wanna change how the horizontal health bars work in the tournament spec gui. At a certain point, the health bar will switch to the right side and expand leftwards when health gets low enough. Instead, I wanna make health only go from left to right. How do I do this? I made the health bars only work for 1920x1080 because I don't know if there's any workaround for making it completely work in all resolutions (working off The Mannterface). I didn't include it originally in nühud, but if you go to [i]spectatortournament.res[/i] > [i]HealthIcon[/i], the value of [i]HealthBonusPosAdj[/i] needs to be changed depending on your resolution. I added a comment for a couple common resolutions recently, but you'll have to experiment with the value if it's something different. Nokk bLa bLaSo, I'm using nokk's nühud, and I wanna change how the horizontal health bars work in the tournament spec gui. At a certain point, the health bar will switch to the right side and expand leftwards when health gets low enough. Instead, I wanna make health only go from left to right. How do I do this? [quote=Nokk][quote=bLa][quote=bLa]So, I'm using nokk's nühud, and I wanna change how the horizontal health bars work in the tournament spec gui. At a certain point, the health bar will switch to the right side and expand leftwards when health gets low enough. Instead, I wanna make health only go from left to right. How do I do this? How do I fix missing main menu buttons? tf2 crashes right before the hud can show the scores at the end of a casual match, which means no elo and I have to restart the game all over again. any idea how to fix this problem? 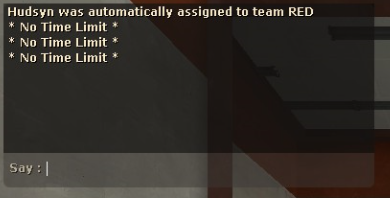 maniacaltf2 crashes right before the hud can show the scores at the end of a casual match, which means no elo and I have to restart the game all over again. any idea how to fix this problem? How do i remove the buffed hp animation. Not_HelpfulHow do i remove the buffed hp animation. I'm pretty sure that has something to do with the hudanimations. I am not entirely sure, but there must be something in there to remove the overheal box. [quote=Not_Helpful]How do i remove the buffed hp animation. maniacal Not_HelpfulHow do i remove the buffed hp animation. [quote=maniacal][quote=Not_Helpful]How do i remove the buffed hp animation. what's the best/most efficient way to reposition item meters? Sorry if this has been asked before, but how do I change the color when I mouseover text in the main menu? Not_Helpful maniacal Not_HelpfulHow do i remove the buffed hp animation. Once you've made the changes, and if you're in game, type hud_reloadscheme into your console, and you should see a change. [quote=Not_Helpful][quote=maniacal][quote=Not_Helpful]How do i remove the buffed hp animation. Does anyone know what part of the HudAmmoWeapons gives a box around the ammo when ammo is low like in 7HUD? bLawhat's the best/most efficient way to reposition item meters? EDIT: Just found out that the old fonts in the clientscheme are still there so it solved itself! How do you delete the little Health box thing around the m0rehud health numbers? SkyH4ighHow do you delete the little Health box thing around the m0rehud health numbers? [quote=SkyH4igh]How do you delete the little Health box thing around the m0rehud health numbers? If you're talking about the scout's milk/ball, the right file is HudItemEffectMeter.res and edit the xpos and ypos inside HudItemEffectMeter. gloperz bLawhat's the best/most efficient way to reposition item meters? If you're talking about the scout's milk/ball, the right file is HudItemEffectMeter.res and edit the xpos and ypos inside HudItemEffectMeter. They shouldn't disappear if you move them from HudItemEffectMeter inside each file (at the very start of the file). While if you change the xpos/ypos of lets say "ItemEffectMeterLabel" or "ItemEffectMeter" they might disappear if HudItemEffectMeter is not wide/tall enough. Unless you have some very restricted values on HudLayout > HudItemEffectMeter as well.